Need to Talk to Your Child About Chores? Use Julia’s House for Lost Creatures | What is ML Reading? When we started reading Julia’s House for Lost Creatures by Ben Hatke, I had no idea I would use it to discuss ML’s need to step it up on her chores. After Julia hangs a sign at her house stating “Julia’s House for Lost Creatures,” a variety of characters arrive… a kitty, a troll, gnomes, a mermaid, a dragon, a ghost and a host of others. Chaos ensues. Eventually, Julia has enough. She yells at the creatures, runs to her workshop and places a “Do Not Disturb” sign on her door. After a bit she returns with a new sign, “Julia’s House Chore Chart.” We giggled at the appropriateness of the assignments. Dragon – make toast. Ghost- polish and dust. One of the most creative story lines I’ve seen in years. 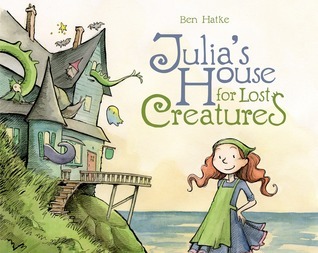 This entry was posted in Picture Book and tagged Ben Hatke, Julia's House for Lost Creatures by mlreads. Bookmark the permalink.